"Miss Phatchara Norbnop, B.Sc. studied and graduated in B.Sc. (First class honors) major of Medical Technology, minor of Molecular Genetics in Faculty of Allied Health Sciences, Chulalongkorn University. Since 2012 she is studying Medical Science in Cell Biology and Human Molecular Genetics as PhD student at the Faculty of Medicine, Chulalongkorn University, Thailand under mentoring of Professor Vorasuk Shotelersuk, MD and Professor Kanya Suphapeetiporn, MD, PhD. For her research education, she worked on a project during her Bachelor’s Degree on the topic of the relevance of genotypic G6PD deficiency and its enzymatic expression on parasite invasion and maturation of Plasmodium falciparum infection. During her Doctor of Philosophy’s Degree she had three research studies; first, identification of ASS1 gene mutation in patients with Citrullinemia, second, Identification of GALT gene mutation in patients with Galactosemia and third, ZRS 406A>G mutation in patients with tibial hypoplasia, Polydactyly and triphalangeal first fingers (published in 2014). Her current research thesis is Generation and safety of HLA-universal, iPSC-derived platelets. Within her thesis, she got the chance to do a research internship in Prof. Dr. med. 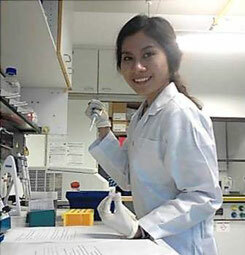 Christoph Klein’s lab, LMU in Munich, Germany with the intent to continue her thesis experiments that she has started from Thailand. Now, she is under mentoring of Dr. Tilmann Schober, who performs a research study of a novel immunodeficiency and she gets the opportunity to observe, conduct and practice experiments."